A quick note before I head into work, and it is early, early in the morning here on Bernie Sanders. My main objection to him is his age. Now I know there are people out there who are going to say I'm being biased, but no, I'm being realistic. Bernie is 74 years old and will turn 75 in September. The average life expectancy for a male in the United States is 76. Now that doesn't mean he's going to keel over, but no matter how good our health care is, his days are numbered, and that could be a sledgehammer in the hands of the Republicans. No one in this country is going to want to elect a president who might die of old age in office. 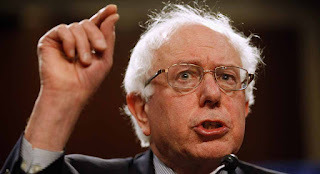 If Bernie gets the nomination they are going to tattoo his birthday all over the media, in fact they are probably praying to their nasty, little GOP god he beats out Clinton because they see him as less electable then a Cruz or a Trump. No one wants to be called old, but there is a point in life when we all need to honestly take that reality check. And if you don't think I'm right, remember how Kerry was "swift boated," and then just imagine what the Republicans are going to do with this elder statesman.